selection of wreaths – many designed to coordinate with available tree styles. Our FEEL-REAL® branch tip technology can also be found on many styles of garlands and wreaths. Wreath sizes from 24 in. to 72 in. We have a wide choice of Artificial Christmas Trees in a variety of sizes & price brackets to suit every pocket, but how do you choose your ideal tree? The newest Christmas tree on the market today is the PE Feel-Real Christmas tree. Showroom visits are by appointment only. Wholesale Buyers, please call the Toll Free Sales Dept. number to make an appointment. 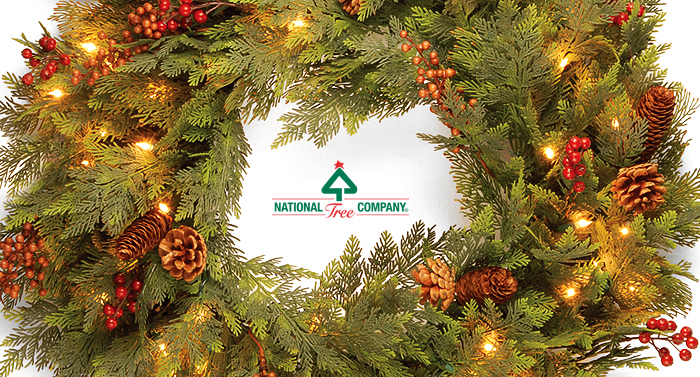 Copyright ©2019 National Tree Company All Rights Reserved.